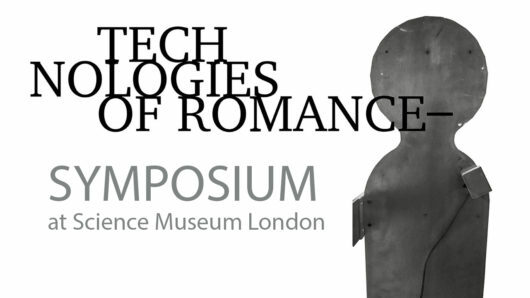 To mark publication of Technologies of Romance – Part II (the new book by AICA member Paul O’Kane), the Science Museum, eeodo artists’ publishers, and Central Saint Martins College, UAL, welcome you to attend a free, day-long symposium on 28 November. Seat numbers will be limited so pre-book with a free ticket. A diverse and dynamic range of artists, lecturers, historians, students and curators from various institutions will exchange ideas and contribute artworks, performances, videos and academic papers on the symposium’s title and theme. The event will conclude with a plenary session followed by drinks and book signing, then at 6.45 pm the museum opens its ‘LATES’ session, with drinks, DJs etc. which all our participants and audience are also welcome to attend. Note: Images sourced from the museum by John Whapham, and used as illustrations in the book Technologies of Romance – Part II, are displayed in the space during the symposium.